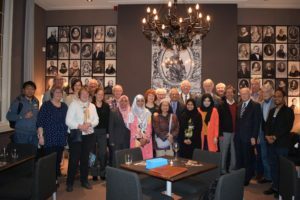 On the 9th of November VNM-members and guests gathered at Leiden University during a meeting around the theme of cooperation between Malaysia and the Netherlands in the fields of science and education. There where four interesting introductions. H.E. Dato’ Ahmad Nazri Yusof, ambassador of Malaysia to the Netherlands, gave an introduction to the opportunities for strengthening the bilateral cooperation on Education and Science. Mr Marius Bremmer of the Hanze University of Applied Sciences at Groningen talked about realizing international internship for students with a special focus on Malaysia. Mrs Sakinah Idris, PhD student at Erasmus MC, presented about Malaysian PhD students in the Netherlands during a speech titled ‘The love for education and science brought me to the Netherlands’. Finally prof Menno Schilthuizen of Leiden University and Naturalis Biodivesity Center lectured about how Malaysian and Dutch biology students collaborate in biodiversity research and training. There was an attentive audience, there were questions and there was a fine informal gathering afterwards.